Can’t avoid the impending Iran deal and the circus now around it but more good news on gay marriage. Climate change was a contributing factor to the war inside Syria. This has been suggested before but now a team of scientists put together a report explaining this fact for the world to understand. They also mention refugees arriving from Iraq as a contributing factor (who caused that again?). But it’s cool everybody because all we have to do is send senile Senator Inhofe over to Syria with a few snowballs and this whole mess will be cleared up quickly. Peace is on the way! Netanyahu’s lies are starting to sink him. A great video on AJA appeared today giving you 5 things he will refuse to admit when he testifies to Congress and is worth watching to give you a quick version of why we should barely pay attention to him. The Intercept also put together a good piece pointing out the many times he has “cried wolf” over the years. Both pieces mention his testimony to Congress about Iraq’s advanced nuclear technology in 2002. Listening to Netanyahu about other country’s nuclear ambitions is like listening to idiot preachers continually predicting the end of the world. No matter how many times these tools are wrong, the foolish still think they speak the truth. See this 90%? That’s the percentage of things I say about Iran that are utter lies. The 10% that is truthful is when I say the name of the country correctly. John Boehner is one of the foolish and can’t hide it. Boehner defended his invite to Netanyahu by stating “Congress wants to support Israel and wants to hear what a trusted ally has to say”. Yes, because Bibi has no way of transmitting his message to Congress in any other way than to give a speech there during an Israeli election year. No one will put a camera on him or a microphone in front of his mouth. Poor fella. It was like he was a ghost prior to giving his speech. By the way, Mr. Speaker. What is the cost of this versus, say, a conference call with Bibi? I mean, you guys are fiscal conservatives so this is the cheaper route, correct? That’s why the Bush administration’s 2007 National Intelligence Estimate said Iran is “guided by a cost-benefit approach.” It’s why Martin Dempsey, chairman of the Joint Chiefs of Staff, said in 2012 that “we are of the opinion that Iran is a rational actor.” It’s why Benny Gantz, then head of the Israel Defense Forces, declared the same year that “the Iranian leadership is composed of very rational people.” It’s why Meir Dagan, the longtime head of Israel’s intelligence agency, called the Iranian regime “rational” in an interview with 60 Minutes. And it’s why Ron Burgess, the former director of the Defense Intelligence Agency, told Congress that “the agency assesses Iran is unlikely to initiate or provoke a conflict.” Could all these men, who analyze intelligence about Iran for a living, be wrong? Nebraska’s ban on gay marriage has been struck down by the courts. Another state is added to the ranks of those on the right side of history. I guess they wanted to be able to say they legalized gay marriage prior to the Supreme Court legalizing it across the nation this coming June. No reason, at this point, to be a state that has to be drug kicking and screaming across the finish line by the federal government. Nearly 80% of the voters in Chicago supported publicly financed campaigns. When put to a public vote, this issue leaves little doubt where many stand on the idea that speech is money and where it belongs in our political campaigns. Most of us want it out and want the corruption that comes along with it gone as well. A Gallup poll showed half of the country was in favor of this in 2013, a number very likely to continue growing as the explosion in spending by outside groups who can hide their donors also continues. Of course, Congress would have to bite the hand that feeds their family members 6-figure salaries to run their campaigns in order for this to change, which means it certainly won’t in the foreseeable future. 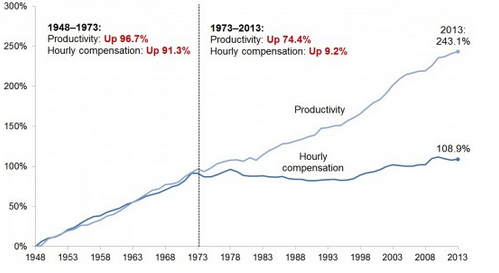 Worker productivity grew 74% in the past 40 years while wages only grew 9%. Because that is totally fair. It’s true that part of the increase is due to technology but the disparity is still startling. Considering the incredible increase in income inequality over the same period, it’s pretty obvious the average American is getting the shaft. It’s also obvious which political party’s ideology is most responsible for this outcome. But hey, voting against gay marriage, climate change, and abortion has worked out really well, hasn’t it? The sea level north of New York City rose over 5 inches in 2009-2010. The article states it was a “1-850 year event” and it’s likely we’ll see this type of thing more often. And, since it’s an article from an international media source, it doesn’t bother digging up a climate change denier paid by the fossil fuel industry to refute the reality. So refreshing when media accepts scientific consensus and doesn’t play to the least knowledgeable among us. If you live in the U.S. then no, you shouldn’t be very afraid of terrorists. An excellent op-ed in The Guardian by a couple of academics noting the recent change in political discourse about terrorism in the U.S. by mostly the Obama administration. In short, if you live here and aren’t traveling to dangerous locales, you are almost certainly not going to die at the hands of a terrorist. And you probably shouldn’t hand over your freedoms and privacy at home in the name of fighting the so-called “War on Terror”. It is astounding that these utterances – “blindingly obvious” as security specialist Bruce Schneier puts it – appear to mark the first time any officials in the United States have had the notion and the courage to say so in public. Which begs the question, will the Israeli military kill over 2,000 people, mostly civilians and children, to get back at these groups like they did to Gaza last summer? I mean, these groups are attacking the Israeli military and “hiding behind civilian targets”, aren’t they? And that clearly doesn’t matter when it comes to bombing populations as they’ve shown in the past, right? What’s the difference? Amazing how the double-standards look when they are revealed. Though often described on conservative news programs as a “Harvard astrophysicist,” Dr. Soon is not an astrophysicist and has never been employed by Harvard. But hey, he has a fancy title and says things certain rich people want to hear so he is believed by those that don’t realize what he says amounts to a steaming pile of horse manure. Sorta like the vast majority of conservative politicians. War on Terror is killing more innocents in Somalia, but with economics instead of military weapons. In an effort to make sure no money makes its way to terrorist groups, banks have closed off any way for immigrants to send money back to their families in Somalia. “Over 40 percent of Somalis rely on money sent from family living abroad to cover needs like food, housing and education, according to a report released Thursday”. This comes after the ugly reality that 260,000 Somalis died during the famine that lasted from October 2010 to April 2012, half of which were children under the age of 5. A surefire way to make even more people hate the West enough to join a terrorist group will be to cut off their lifelines and push them to the brink of starvation in the name of fighting extremists. More children in South Sudan have been abducted from school to be soldiers. 89 boys (possibly more) have been added to the 12,000 other children that have been used as soldiers in the country. It’s a sad irony they are taken so young from school when expanded education would likely lead to a quicker and lasting peace. It’s an awful cycle of violence that actions like this will likely help continue for a long time to come. I see London, I see France, I see Satan in that Yoga stance! Giuliani now implying President Obama is a Communist. And he is totally correct. I mean, after six years of his heavy-handed rule, the United States is a Communist country in every way imaginable. Just look at how afraid people are to speak out against him and his policies and denounce him with outright lies in the media. He is such a vicious dictator! United States’ defense spending is still pretty ridiculous. “The United States spends over four times as much in its defense budget as its nearest rival, China. In fact, its budget comes close to matching that of its 14th closest rivals put together.” Just imagine where the U.S. could be in terms of truly important areas like education if we just cut that budget in half and spent the money on improving schools or infrastructure or shoring up Social Security for good. But I guess it’s good that we can use our absurd military spending to stabilize places around the world like in Iraq, Afghanistan, and Yemen and help keep the antiquated idea of monarchy alive and strong in places like Saudi Arabia and Bahrain. Yay, America! France sold the Egyptian government military equipment. 24 Rafale fighter jets along with other supplies amounting to over $5 billion will be headed to the government that came to power in a not-a-coup military coup. While the Egyptian government is seemingly making some strides toward logic, it’s probably far too early to start selling them equipment that they may decide to use on say, I don’t know, their own people. But, like the U.S. military industrial complex, when you have a bunch of war equipment burning a hole in your pocket, gotta find somewhere to sell it no matter how immoral. Between 1991 and 2013, the violent crime rate declined by more than 50 percent, according to FBI figures. During the same time frame, property crime fell by 46 percent. On gay marriage, insane right-winger Ted Cruz morphs into…a moderate democrat?! It’s true as the last-ditch effort before the nationwide legalizing of gay marriage coming in June is to apparently try to pass a bill calling for states’ rights on the issue. Saying it should be left up to the states to decide is basically the exact argument many Democratic politicians were making 10 years ago when they were too cowardly to just stand up for what was right (I’m looking at you, former presidential candidate Kerry). On a side note, the language Cruz and his ilk use on the issue is both ridiculous and vicious. He states his bill will “safeguard the ability of states to preserve traditional marriage for their citizens” (emphasis added). This suggests “traditional marriage” will simply cease to exist if gay marriage is ever allowed, which has already proven to be clearly untrue and is just a ranting from a madman. Hard right-winger Stephen Moore took a break from pushing debunked trickle-down economic policies to take a pathetic shot at clean energy. Let the stupid begin. Seriously? He goes on to mention the famed Sierra Club as one of these forces. And where did they rank in 2013 on lobbying: 755. In fact, if we look at the top 50 interest groups giving to members of Congress this year, no sign of a “clean energy” or “renewable energy” group in the rankings. Yet, they are one of the “most influential” because Stephen Moore says so and not because any facts back it up. Kind of like the blackouts induced by the infallible private sector giant, Enron, in California over a decade ago? Remember kids, always let the fossil-fuel guys have their way and nothing will ever go wrong. America gets about 40 percent of its electricity from coal-fired plants. Correct. And one day, whether it’s because climate change has erased mankind off the face of the earth or because we run out of coal, that percentage will be zero, which is the whole point of finding renewable sources and getting them in use as fast as possible. This ignores other ugly realities of coal, such as the destruction caused by mountain top removal. Moore might want to look into that some time. But the environmentalists are…raising unsupported objections to fracking. Unsupported? If they are so unsupported Mr. Moore, please allow a fracking operation to begin close to your home, just like the CEO of Exxon refused to do. And what about the growing research showing the relationship between fracking and increased earthquakes? Unsupported? Not really. Sorry, for the foreseeable future, we aren’t going to get our power for our $18 trillion economy from wind turbines and solar panels. And if we begin to try, prices are going to skyrocket. Panels now sell for less than a quarter of their 2008 price…Bloomberg estimates that the world will have 600GW of photovoltaic solar worldwide by 2020 (an increase from about 150GW today) and 1,900GW by 2030; making up 5-7% of the global electricity mix. These positive predictions are based on the falling prices of renewables. …the Greens think oil is a “dirty” fuel that causes global warming. Let me fix that statement for you. Scientists know oil is a “dirty” fuel that causes global warming. There you go, Mr. Moore. You’re welcome for the assistance. Some Republican members of Congress have contended that the science of global warming is a hoax perpetrated by a global conspiracy of climate scientists, a point of view Mr. Obama has mocked as comparable to belief in a flat earth. The report was supervised and approved by a large committee representing a cross section of American society, including representatives of two oil companies. Hopefully the press this report is getting will let some of the included information get-through. And just because the NCA is supported by the White House doesn’t mean that the information is some partisan ploy. This fact is exemplified by the fact that these NCA’s are to be conducted every four years no matter which party is in power. Now we’ve got to get to the fact that why only three have been conducted (they have been missed by both Pres. Clinton and Bush) when the Congress ordered the NCA be compiled every four years. A U.N. panel (the Intergovernmental Panel on Climate Change) reported today that it would cost less to prevent climate change today than to deal with it later. It outlines that it will be cheaper to develop green energy solutions and lower CO2 emissions standards today than to deal with reversing the causes of global warming in the future. And if we wait even later we will have to financially recover from global catastrophes caused by the phenomena, eating into our bottom line. Maybe this economically-centric argument may give some push against right-wing, business interests opposition. Climate change: Scientists now 95 percent certain we are mostly to blame – CSMonitor.com. Certainty over the human role has increase from “very likely” to “extremely likely,” a verbal shift representing 90 percent certainly in 2007 to 95 percent for this round of reports. For instance, when the first working group’s volume was released in 2007, researchers criticized it for failing to include in its sea-level projections the contributions from melting ice sheets in West Antarctica and Greenland. The working group didn’t include those because they weren’t well understood. Yet research published after the deadline for that report indicated that the melting appeared to be increasing. Solar physicists have been looking at trends in sun-spot behavior and characteristics over the past decade and have raised the possibility that when the current sun-spot cycle peaks in the next few months, the sun could enter an unusually long period where it generates few, if any sunspots. Some climate scientists have looked at the potential impact of such an event and concluded that it likely would delay additional global warming – but only until the sun returned to more-normal swings in sun-spot activity. I can say that I love our Bluegrass State and will probably never reside elsewhere. But we have a problem here in the Commonwealth where many uneducated folks get involved with public issues without knowing what they’re talking about. This same affliction also affects other states in the South for we are not alone. Evolution and climate-change lessons in the classroom are under threat in many states, as they are here in Kentucky. Read this article Louisville’s own Courier-Journal, for instance. A new study of over four thousand academic papers taking a position on climate change found the same results that were published in a similar study nearly ten years ago: over 97% of academic climate researchers believe climate change is man-made. Only 0.7% disputed the idea. Yet, as noted in the article, a recent Pew poll found only %42 of Americans agree with the science. The reasons for this disparity are numerous but one of the obvious parties due blame is the media and its attempt to be objective on the subject. If they put on one of the 97% of scientists believing the truth, they feel the need to put on one of the 0.7% in an effort to show no favoritism. The time has come for this to stop. The most glaring problem with this action is how dangerous the situation is and how much its worsening, as the Earth reached its recent carbon dioxide milestone which hasn’t been seen in 3 million years. If you were jumping out of a plane and 97% of sky diving instructors told you your chute was not packed right and wouldn’t open on the way down, would you jump? If you were riding down a winding mountain road and 97% of mechanics told you your brakes would fail halfway down, would you drive? If you were running from a giant boulder after stealing an ancient artifact from a temple in Peru and 97% of boulder dodgers told you to keep running instead of trying to use a whip to split the boulder in half, would you keep running? If you were trying to kick a football being held by a “friend” when 97% of your real friends told you the ball would be taken away as you tried to kick it and you would land on your head, would you still try to boot it? If you were interacting with a doctor about a rash of stomach viruses and 97% of people informed you his name was not Shirley, surely you would not call him by that name, right? The point being rational people pretty much never go against these types of percentages when it comes to their personal health yet we seem to be doing it when it comes to the long-term health of everyone. 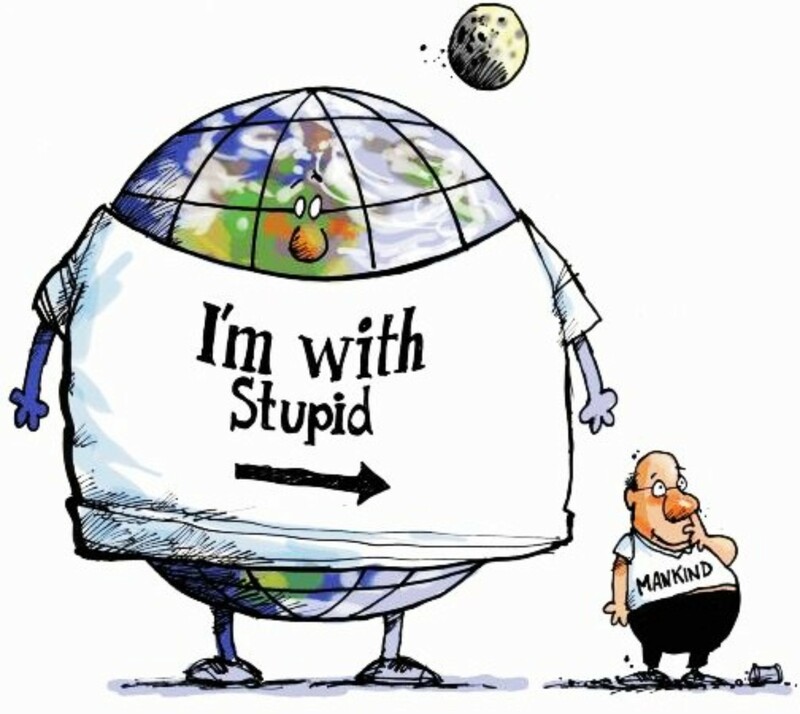 It’s time to change our collective tune on climate change and accept the consensus of the 97% over the seemingly wild ramblings of the less than 1%.